Absolutely Protea is located on the slopes of Mauna Loa on the Big Island of Hawaii in the Northern Hemisphere. Owned and operated by Sally Myers and Jay Lovell, the farm was conceived out of their mutual love for Protea and their passion for each other. Because of their fascinating beauty and incredibly long life, Protea are the perfect choice—for weddings, birthdays, holidays, special occasions, corporate events and much more! Many varieties of Protea bloom on the farm at various times throughout the year. Although the flowers share common characteristics like strength and durability, they differ widely in size, shape, texture and hue. Reds, yellows, purples, oranges, greens, pinks and more—the colors are simply AMAZING! Protea are unbelievably hearty and enjoy a longer vase life than most fresh cut flowers. The recipient of your gift will delight in their beauty for weeks! Because Protea last so long, they also work well for events. Order them to arrive a week in advance, and they'll still be gorgeous on the big day. Protea don't die. They dry . . . and continue to bring joy for months and even years. When Protea are allowed to dry naturally, their bright colors soften to more muted shades, offering a different—but equally lovely—kind of beauty. Because they dry so well, Protea are often used to create eye-catching arrangments and crafts. Protea are not your typical flower: their beauty is rare and distinct. When you choose these stunning blooms for your gift or occasion, you'll create a significant and lasting impression. And buying farm direct makes Protea a pleasure you can afford to enjoy yourself and share with others...often. The Absolutely Protea farm is near Hawaii Volcanoes National Park, which encompasses Kilauea, one of the world's most active volcanoes, and Mauna Loa, the world's most massive volcano. 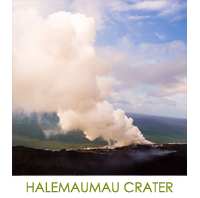 Kilauea's Halemaumau crater is believed to be the sacred home of Madame Pele, Goddess of Hawaiian Volcanoes. Sally and Jay visit Halemaumau crater often with offerings of Protea for Madame Pele.